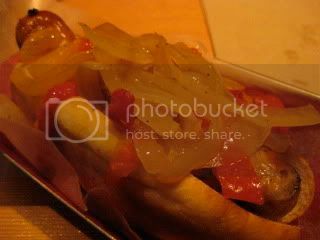 HAPPY DONABE LIFE - Mrs. Donabe's Rustic Japanese Kitchen: Hot Dog and Beer! I am back in LA. Yes, I miss Japan, and I miss my family and friends there. But, I love LA also! Los Angeles is a wonderful city with wonderful people and culture. Since I returned to L.A., I've been eating very American food. I just don't have time to go shopping or cook this week. 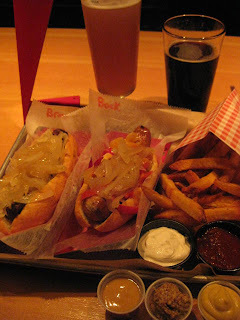 We picked up a large pizza from Two Boots yesterday, and and tonight was hot dogs and beer at Wurstkuche in Downtown. Pretty, pretty good! I will get back to my donabe cooking very soon...once my jetlag is gone and am ready to cook again.